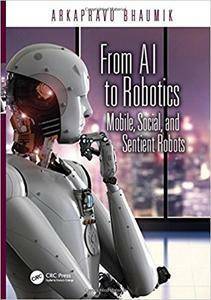 Arkapravo Bhaumik, "From AI to Robotics: Mobile, Social, and Sentient Robots"
The book furthers the discussion with concepts of Artificial Intelligence and how it manifests in robotic agents. Discussions across various topics are presented in the book, including control paradigm, navigation, software, multi-robot systems, swarm robotics, robots in social roles, and artificial consciousness in robots. These discussions help to provide an overall picture of current day agent- based robotics and its prospects for the future. Examples of software and implementation in hardware are covered in Chapter 5 to encourage the imagination and creativity of budding robot enthusiasts. The book addresses several broad themes, such as AI in theory versus applied AI for robots, concepts of anthropomorphism, embodiment and situatedness, extending theory of psychology and animal behavior to robots, and the proposal that in the future, AI may be the new definition of science. Behavior-based robotics is covered in Chapter 2 and retells the debate between deliberative and reactive approaches. The text reiterates that the effort of modern day robotics is to replicate human-like intelligence and behavior, and the tools that a roboticist has at his or her disposal are open source software, which is often powered by crowd-sourcing. Open source meta-projects, such as Robot Operating System (ROS), etc. are briefly discussed in Chapter 5. The ideas and themes presented in the book are supplemented with cartoons, images, schematics and a number of special sections to make the material engaging for the reader. Designed for robot enthusiasts – researchers, students, or the hobbyist, this comprehensive book will entertain and inspire anyone interested in the exciting world of robots.